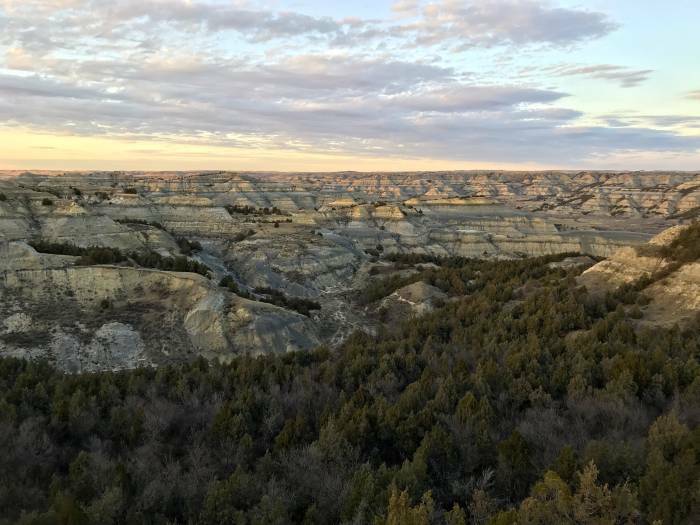 Theodore Roosevelt National Park, nestled in the Badlands in the southwest corner of North Dakota, is a colorful, dynamic, unpopulated playground for outdoor enthusiasts. From packrafting to backcountry hiking, mountain biking, and wildlife viewing (read: hundreds of wild bison, horses, deer, pronghorn antelope, prairie dogs, hawks, etc. ), our visit to the North and South Units of Theodore Roosevelt National Park was filled to the brim. We stuck around from April 21 to 26, the tail end of the park’s off-season. This coincided with the peak flow of the Little Missouri River. The campgrounds were quiet and empty, and the weather was primo: highs in the 60s and lows in the 40s. Before our trip, people told us to be sure to visit the North Dakota Badlands. But we envisioned them being a lesser version of the more recognizable (and well known) South Dakota Badlands (i.e., Badlands National Park). 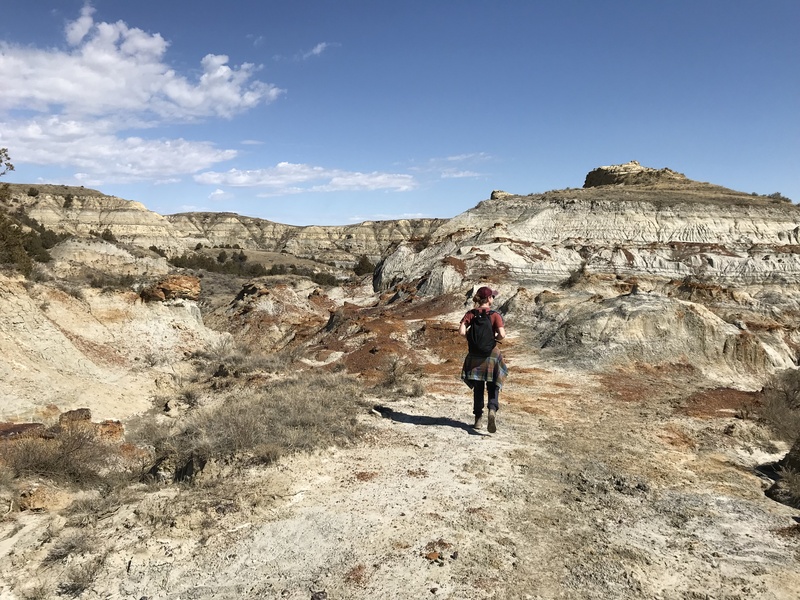 The Badlands of Theodore Roosevelt National Park were mind-bogglingly beautiful – rugged, giant sedimentary rock formations with colorful layers stretch for miles. And with no regulations requiring visitors to stay on established trails, the park is an adventurer’s playground. After some brief research on nps.gov and in our book (recommended), it was very apparent that no reservations or permits were going to be needed for our off-season stay. Even the town of Medora, North Dakota (the entrance to the South Unit), doesn’t really open for the season until early to mid-May. Upon arriving at the North Unit, we stopped in the visitor’s center for a map, some trail recommendations, and to inquire about the river level. Beyond that, we planned each day’s activities the night before. 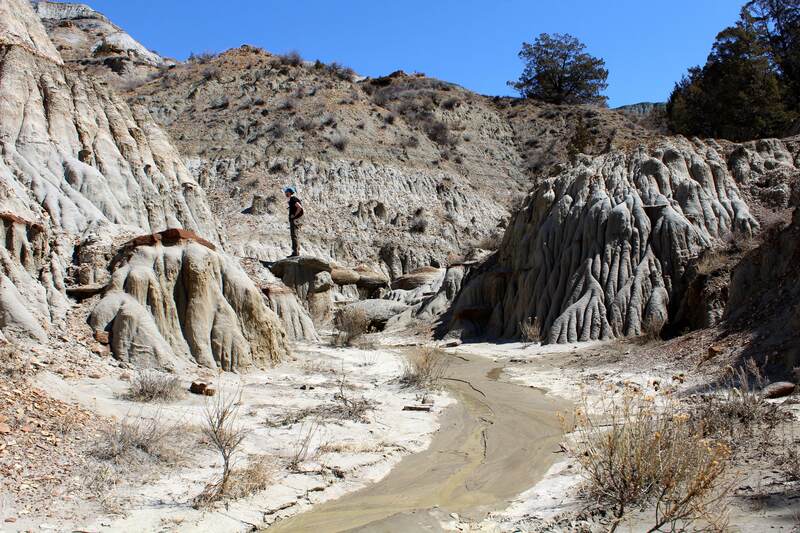 A moderately difficult 4.2-mile loop, the Caprock Coulee Trail is one of the more popular day hikes in the North Unit. We started around 7:30 p.m. with headlamps in our bags, racing the clock to fit in one more trail before day’s end. The trail winds in and out of the Badlands formations. 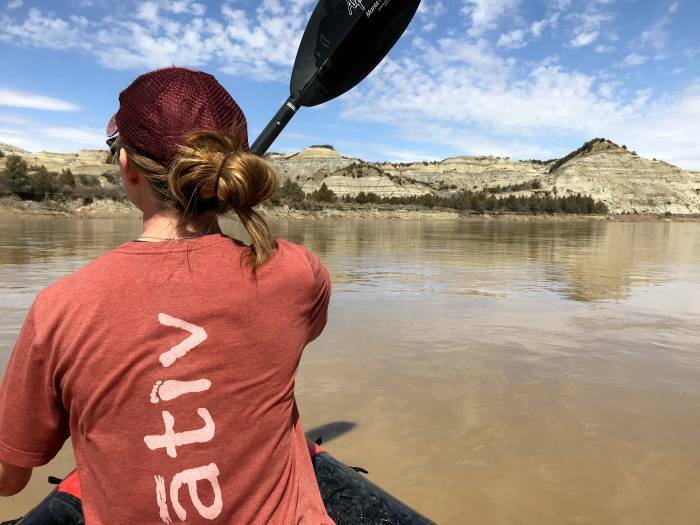 It dives deep into steep canyons and back out to an overlook of the Little Missouri River. We arrived just at sunset (highly recommended) as pink, purple, blue, orange, and yellow illuminated the valley below and distant rocks. After asking about the river level at the visitor’s center and looking closely at the park map, we discovered that the South Achenbach Trail goes down from Sperati Point (a nice overlook) and across the Little Missouri River. You can trace the river north all the way back to Juniper Campground, the only campground in the North Unit. With an Alpacka Gnu and a couple of Aqua-Bound Manta Ray Carbon 4pc paddles in our gear stash, it was an obvious adventure to take on. With the 8-pound packraft in one backpack and paddles, food, and water in another, we hiked about 4 miles down to the river and floated 10 quick miles in two hours back to our campsite. Beware: The river is muddy and really only floatable in the spring. A rarely traveled 11.4-mile loop in the wilderness area of the North Unit, Buckhorn Trail made for an epic day. It’s a fantastic remote trail that puts you alongside prairie dog towns, grazing bison, and bighorn sheep through Badland canyons and atop grassy plateaus. The trail is difficult to follow due to bison trails and miniature streams that tend to look like hiking trails. Few and far between are signposts that mark the way. It’s an excellent challenge to navigate in the wilderness, and the trail encompasses everything the park has to offer. Bring ample water and hone your orientation skills before tackling it. In the South Unit, many consider the 36-mile scenic loop drive the main attraction. 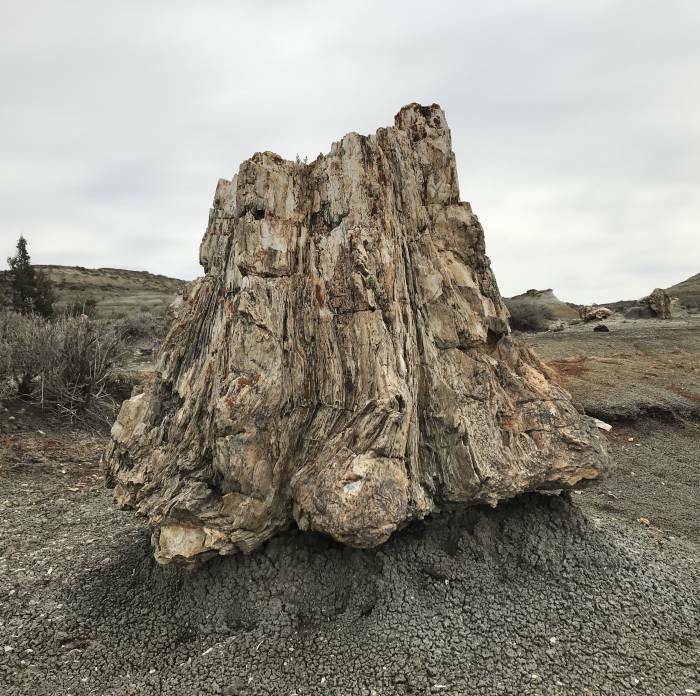 It’s enjoyable and worthwhile, but the Petrified Forest in the northwest corner of the park is a better way to get out there and see new scenery. The ancient forest is only accessible via a long, one-way hiking trail from within the park or by exiting the park in your vehicle and driving 7 miles north on a dirt road. Once a luscious everglade forest, the place is now a desert basin filled with petrified wood. The wood is rock hard, with massive stumps and tiny shards dotting the landscape. 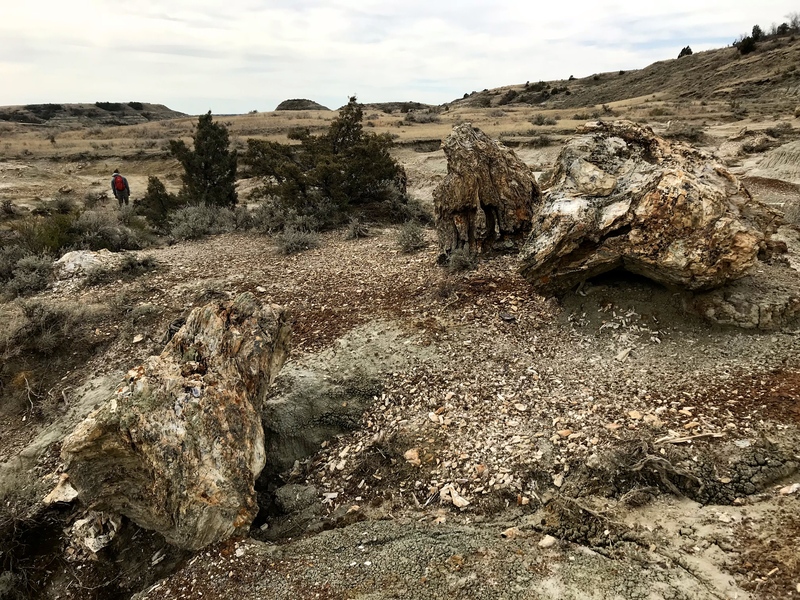 It’s extremely unique, and a 10-mile hiking loop takes you along the areas with the most petrified wood. If you want to skip the 10-mile loop, at least do an out-and-back along the North Petrified Forest Trail. Bring binoculars – there’s wildlife everywhere! Bison, prairie dogs, deer, pronghorn antelope, bighorn sheep, longhorns, hawks, and other species are around every corner. Every hike and drive feels like a safari. Wear hiking shoes that can withstand a lot of mud. 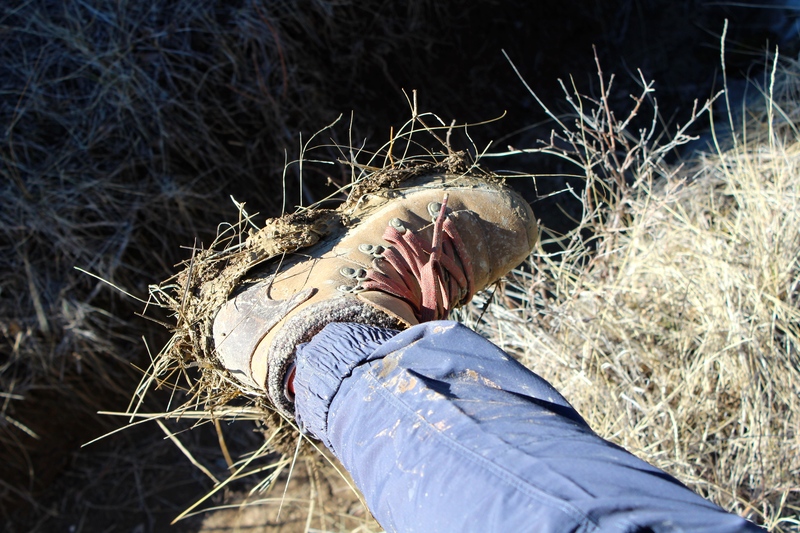 The ground is soft, dried mud, and though it may look dry, it can be extremely squishy. Our shoes became caked with mud, adding pounds of weight and slowing us down. Expect to get dirty, especially after a recent rain. Don’t be fooled by the small size of the North Unit compared to the South Unit. 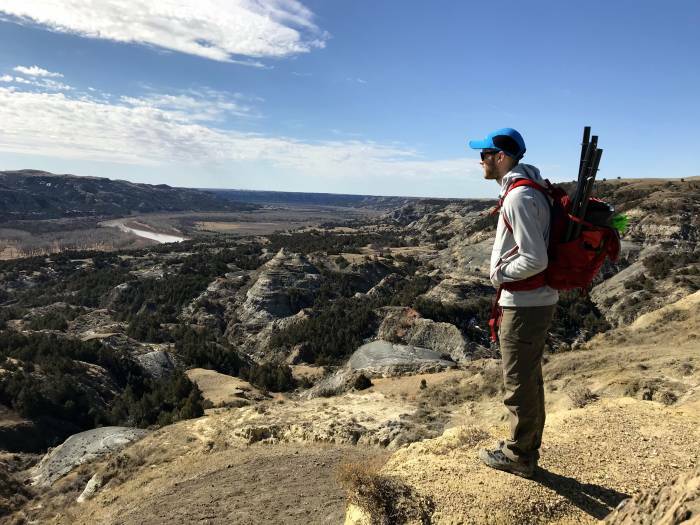 We found the North Unit to be less crowded and more varied, with great hiking trails and epic views of the Little Missouri River. Plan to spend some time up there, about 1.5 hours north of the South Unit. Consider visiting the park in late April, like we did. The weather is getting warmer, the river is at its highest, and you have the whole park to yourself. Water is unavailable in the park. You have to bring water in bulk from nearby towns before entering (due to excess minerals in the water). The nearest towns are easily accessible via 10- to 20-minute drives. The Maah Daah Hey Trail, a well-known long-distance mountain biking trail, cannot be biked within park boundaries. Though it does cut straight through the South Unit, you can only ride the trail south and north of the park. If you’re looking to tackle the whole 150-mile route, plan to hop on the Buffalo Gap Trail, which skirts the South Unit and reconnects with the MDH just to its north. We opted for 12 miles of fun and scenic riding on a section called The Deuce. This part of the Maah Daah Hey Trail is just south of Medora. Medora is a tiny western town at the entrance of the South Unit. On a map, it looked like a decent-sized city where we could find Wi-Fi, grocery stores, and hangout spots. The one convenience store, the town’s only gas station and grocery retailer, had some water jugs and a few camp necessities. Otherwise, because the season doesn’t start until May, the town was dormant with one open restaurant. During peak months, though, it looks like it could really come alive with a fudge shop, a movie theater, museums, and more. Knowing almost nothing about the park before our visit, it very quickly surprised us with its variety, beauty, abundant wildlife, and epic adventures. Don’t stop with the tourist trap of the scenic drives. Instead, get out there and explore the vast playground in any number of ways. You won’t be disappointed.